These will be long lasting because such great quality. Lovely, flowing elegance and fully functional design are at work in this blackout curtain panel. The generous length and thick, resilient fabric are a decadent and atmosphere-enhancing addition to any home. 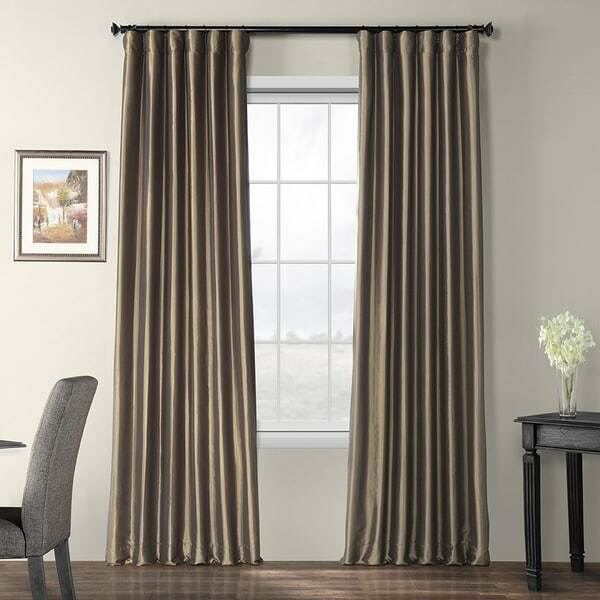 Not much selection of 120 inch curtains available online at a great price. But when I got these they were perfect! At a decent price for the length too. The faux silk is good. Especially love the blackout thick lining. Our old real silk curtains were literally destroyed by the sun and tore up. Would recommend blackout curtains in areas of the home that has direct sunlight all the time. Makes a huge difference in keeping room cool. Great quality for the price, I could not have made them for what I paid. I turned my mother who is a picky award winning interior designer on to these and she's recommending them also. The blackout is excellent. I love these curtains! They are stunning. I have received several compliments and will buy more for my new home. A great product for a great price. These drapes are amazingly beautiful and a fraction of the cost that you would pay for designer store bought drapes. The color is fresh and the fabric is not shiny but it does have a sheen to it. I love these drapes! Very happy with these curtains. They are a great coppery brown color, just enough sheen, without being super shiny. Was the perfect finishing touch to our living room. So happy we bought them. Loved these curtains, the color and texture was beautiful. Shipping was fast and they were shipped very nicely in the boxes. Just didn't fit my windows as I would like. Nothing to do with the curtains. Love Overstock! High quality heavy weight. Beautiful color. Overstock has the most amazing customer service team! Beautiful, functional, and delivered promptly. These are exactly what I was hoping for!! They also keep out the sunlight nicely. "How many panels come in 1 order?" Hello Alejandra, this item features one panel per order. Thank you for shopping with us. I have them already love the color. "What color is the blackout lining? Is it white on the back?" Hello Natasha, the blackout liner is ivory. Thanks for shopping with us!